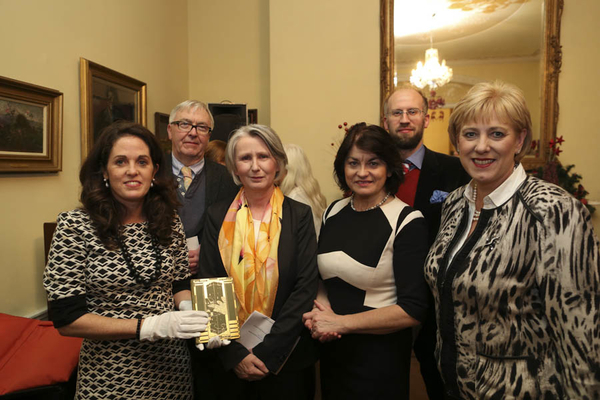 In 2015 Ireland celebrates the 150th anniversary of the birth of the Nobel Prize-winning poet, William Butler Yeats. As part of Ireland’s decade of commemorations, a worldwide series of creative and cultural events takes place throughout the year to mark this occasion, honouring and exploring his rich life, work, and legacy. The programme was launched in Dublin in December by Senator Susan O’Keefe and the Minister for Arts, Heritage and the Gaeltacht Heather Humphries. The launch also featured a reading by Olwen Fouere of ‘Sailing to Byzantium’, and was attended by members of the Yeats Thoor Ballylee Society. An RTE report of the event can be viewed here. Yeats 2015 presents a local, national, and international series of exhibitions, performances, educational events, festivals, concerts, readings, talks, and screenings. Cultural events centred on Sligo, Galway, Dublin, London, and in counties across Ireland, are echoed in a diverse international programme. Through the prism of one of Ireland’s greatest artists, Yeats 2015 marks a moment to celebrate and promote creativity in Ireland and elsewhere, and to reconsider the role of culture, community, and the arts in the contemporary world. Full details of how to get involved in this exciting cultural programme are released in January 2015. The re-opening of Thoor Ballylee is at the heart of these commemorations. Galway is at the heart of these celebrations and a full programme of Galway Yeats2015 events is available here. W. B. Yeats is Ireland’s greatest poet, and considered by many the finest poet of the twentieth century. Seamus Heaney noted that as well as a great poet he was both the founder and inheritor of traditions: with a lifelong interest in the occult and in Irish mythology, an openness to European art and eastern philosophy, and with a sceptical, questioning intellect, he brought a revolutionary new voice into Irish literature. A maker of extraordinary love poems and an architect of modernism, Yeats is unusual among poets in that much of his best work came after the age of fifty. The way he put words together changed utterly: from an early lush lyricism, he developed a spare, hard, late style, and many of his most powerful lines have entered the language. Such an uncompromising attitude to creative excellence was a part of his inheritance. He was born into an extraordinarily talented artistic family: his father John Butler Yeats was a renowned portraitist, his sisters were innovative craftworkers and printers, and his brother Jack Yeats became Ireland’s most celebrated painter. His unrequited love for the beautiful Maud Gonne affected the course of his life, while his collaboration with his wife George altered the texture of his poetry. More than a poet, Yeats was a dramatist, a critic, a journalist, a politician, and a founder of theatres, print houses, dance companies, and artistic societies. With its diverse programme of events, Yeats 2015 celebrates this rich cultural harvest. W. B. Yeats’s profound connection with landscape and architecture served as inspiration for many of his greatest works. Ireland is the setting for nearly all his poems and plays, whether the city’s ‘grey eighteenth-century houses’ or the stones and trees of the west. Born in Dublin, Yeats went to school in Dublin and London, and spent much of his young life with his family in Sligo, which he thought of as his spiritual home. In later life he lived in Dublin, London, and put down deep roots in County Galway, spending summers at Coole Park and restoring a Hiberno-Norman tower, Thoor Ballylee, as his family home. As well as travelling extensively in France, Spain, Italy, and the United States, Yeats was deeply affected by eastern art and philosophy, especially that of Japan and India. Yeats 2015 celebrates the strong connection he had will all the places that inspired him.Galway is therefore at the heart of these celebrations, with a full programme of exciting artistic and cultural events taking place throughout the county. It is intended also that the re-opening of Thoor Ballylee will be a central part of these celebrations. Yeats was the first Irishman to be awarded the Nobel Prize, in 1923. He accepted on behalf of his work for the Abbey Theatre, Ireland’s national theatre which he co-founded with Lady Augusta Gregory. Such artistic generosity was not unusual. Yeats was a cultural revolutionary who become a remarkable cultural entrepreneur. A spearhead of what became known as the Irish Literary Revival, he spurred a revival of interest in Irish mythology and in Irish literature, and was for a time deeply involved in the nationalist movement. His work explored the complexities of the formation of the new state and helped give expression to a new Irish identity. Passionate about artistic freedoms and minority rights, he made speeches against censorship and supporting the long-established right to divorce when appointed a Senator of the Irish Free State in 1922. Yeats also chaired the commission for coinage, which produced renowned designs of Irish animals on currency in use until 2001. His increasing identification with a Protestant tradition and his brief flirtation with authoritarian politics remains controversial. But most of all he promoted new art, championing writers as diverse as James Joyce, Frank O’Connor, and J. M. Synge, working with an astonishing variety of artists, actors, musicians, theatre designers, printmakers, producers, and dancers. From his founding of the ground-breaking Cuala Press to his pioneering work as a radio broadcaster, his legacy is just as varied. His belief in art’s power – that words could change the world – makes his example still powerfully resonant today.